classifieds.valleybreeze.com classifieds.valleybreeze.com p74274.ad.crtr - Page 1 - Composite Job Number: p74274 Customer: Valley Breeze Misc. House 2011 Phone: (401) 334-9555 BLACKSTONE, MA: Yard Sale. Sat., July 14th, 8 a.m. - 2 p.m. 108 Farm Street. Puzzles, books, jewelry, office supplies, mens & womens clothing, widget boxes full. Much, much more! CUMBERLAND: Moving Yard Sale. Sat. & Sun;. July 14th & 15th;, 8 a.m. - 3 p.m. 54 Bear Hill Rd. Household items, fur- niture, ceramics, electric kiln, electric appliances, electron- ics, tools, clothing, collectibles.No early birds! Rain/shine! GLENDALE/BURRILLVILLE: Saturday & Sunday, July 14th & 15th, 9 a.m. - 2 p.m. 300 Joslin Road. Lots of Books, clothes for kids and women, toys and household goods. Rain or Shine. LINCOLN GARAGE/YARD Sale: Sat., July 14th, 9 a.m. - 3 p.m. 1138 Great Rd. Clothes, fridge, books, tools, furniture, household items and more! MILLVILLE, MA: Garage Sale. Fri., July 13th, 10 a.m. - 3 p.m. and Sat., July 14th, 8 a.m. - 3 p.m. 26 Chesley St. Mostly bar mirrors, glasses, neons, signs, Jim Beam de- canters, jackets, household items, small furniture, yard tools and more. Rain or Shine! 774 287 1195 NO. SMITHFIELD Multi-Family Yard Sale: Sat., July 14th, 9 a.m. - 2 p.m. 25 Deerfield Dr. Great variety, something for everyone! No early birds. NORTH SMITHFIELD: Multi-Family Yard Sale. Sat., July 14th, 8 a.m. - 2 p.m. 111 Log Road. Skis, frames, kitchen items, craft supplies, books, clothes, two rooftop cargo carriers, toys, many Disney VHS tapes and much more. Must see! PAWTUCKET: Costume Jewelry Factory Sale. Thur. & Fri., July 12th & 13th, 8 a.m.- 6 p.m, Sat., July 14th, 8 a.m. - 4 p.m., 106 Tweed St. 7/9-7/14, M-F, 8-6, Sat., 8-4. Starting prices $1. Rain or shine! WOONSOCKET YARD SALE: Sat. & Sun., July 14th & 15th, 8 a.m. - 3 p.m. 56 Spring St. Toys, clothes, books, Christmas decorations, tools, misc. items. Everything must go. Easy bargaining. 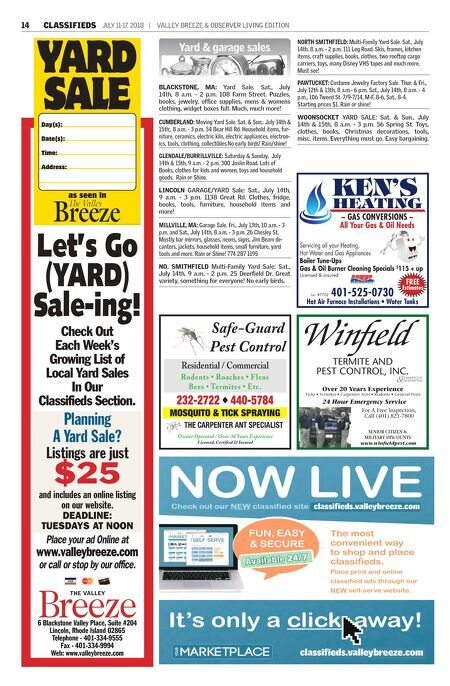 14 CLASSIFIEDS JULY 11-17, 2018 | VALLEY BREEZE & OBSERVER LIVING EDITION KEN'S HEATING ~ GAS CONVERSIONS ~ All Your Gas & Oil Needs 401-525-0730 Hot Air Furnace Installations • Water Tanks Lic. #7702 Servicing all your Heating, Hot Water and Gas Appliances Boiler Tune-Ups Gas & Oil Burner Cleaning Specials $ 115 + up Licensed & insured FREE Estimates SENIOR CITIZEN & MILITARY DISCOUNTS www.winfieldpest.com 24 Hour Emergency Service For A Free Inspection, Call (401) 821-7800 Over 20 Years Experience Ticks • Termites • Carpenter Ants • Rodents • General Pests Winfield TERMITE AND PEST CONTROL, INC. & COMMERCIAL RESIDENTIAL THE CARPENTER ANT SPECIALIST Safe-Guard Pest Control Owner Operated / Over 30 Years Experience Licensed, Certified & Insured 232-2722 • 440-5784 Rodents • Roaches • Fleas Bees • Termites • Etc. Residential / Commercial MOSQUITO & TICK SPRAYING 6 Blackstone Valley Place, Suite #204 Lincoln, Rhode Island 02865 Telephone - 401-334-9555 Fax - 401-334-9994 Web: www.valleybreeze.com Check Out Each Week's Growing List of Local Yard Sales In Our Classifieds Section. Planning A Yard Sale? Listings are just $25 and includes an online listing on our website. 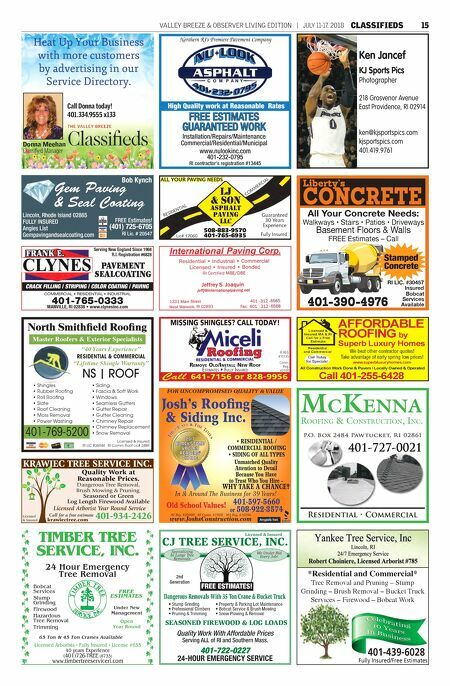 DEADLINE: TUESDAYS AT NOON Place your ad Online at www.valleybreeze.com or call or stop by our office. Let's Go (YARD) Sale-ing! YARD SALE as seen in Day(s): Date(s): Tim e: Address: Please dispose of this sign as soon as your Yard Sale ends. Thank you!